As October raises sleepy eyelids, November lies in wait, and hundreds of thousands of writers around the world sharpen their pencils and prime their word processors for the thrill ride of the year. For the past ten years, I’ve tackled National Novel Month along with them, and you’re damn right I’m ready to dive back in. Or at least…mostly ready. Which is like being ready, with a dash of apprehension and a pinch of uncertainty. What I mean by that is as I’ve started to pick through the plots I’ve been stashing away for the annual literary mad-dash, I’ve found that I can’t choose just one. I’m a plantser, and always have been. Non-NaNoWriMo speakers probably think I just spelled “planter” wrong. I didn’t, I promise. A plantser, you see, is a mixture of a “planner”, or one who carefully plots out and plans their novel before November first, and a “pantser”, which is not a misspelling of “panther” (thanks for trying, autocorrect) but instead a novelist who chooses to forgo planning and fly by the seat of their pants for thirty wild days. Plantsers like myself sit somewhere in the middle. We don’t live by our outlines, but we’re going to do some molding of our ideas before we jump into the fray. For me, this normally means going in with what I call mystory skeleton. This is a set of ideas that outlines the basic structure of my plot. Once I have the bones set up, I can layer on top of them throughout November until I have my finished draft. That’s what my prep will consist of for 2018. I’ve got one plot that I’m leaning towards, so I’m using that for the plot-related prompts in the Preptober Instagram Challenge, but I’m truly confused about what story to actually write. Ah, indecision. A phenomenon I’ll never escape. In the meantime, I’m also working on an excited project for Halloween! THIRTEEN HAUNTS OF HALLOWEEN will be a 13-night short fiction event. Each day will find a new flash fiction story featuring a classic Halloween monster. I’m incredibly excited about this series! Halloween has long been my favorite holiday, and I’m a long-time fan of spooky stories and the creatures that inspire them - contributing my part to the lore of these incredible beings is something I’ve always wanted to do. So grab your wooden stakes and silver bullets and mark your calendars for October 19th! And keep an eye on my Twitter for updates on the series. I’ll be posting some hints soon! If you would like to be a part of the series, you can become a story sponsor by donating on Patreon! My first thirteen Patreon supporters will be listed as sponsors in a special “brought to you by” section of the thirteen spooky shorts. Tiers are currently set up at $1, $2, and $3 levels. Join my Patreon family today to support Thirteen Haunts of Halloween and so many more stories to come! The worst thing about anxiety is the way it holds you back from what you really want to do. Like, nails in your arms, heels dug in, growling in your ear that you’re not good enough or that you’re too weird holds you back. Like, cancelling plans at the last minute because the fear of unknowns is greater than the excitement of could-bes. Because even when something sounds incredible, even when it’s totally up your alley, even when it’s all that you want, anxiety says no. For me, one of those things was public write-ins. Specifically, I wanted to go to a local NaNoWriMo meet-up. The closest I’d ever gotten was participating in my high school’s creative writing club, or heading to Barnes & Noble with a friend, and both of those involved writing alongside people I knew well in places I was already familiar with. Compared, the unknowns of writing with total strangers in a new place in a town I rarely visit and a store I never go to stacked up pretty damn high. And so, whenever November rolled around and my regional forum started to pile up with plans to meet here and there and write together, I would always post that I would try to make it and then ghost at the last second. But I made a promise to myself at the start of 2017. A New Year’s Resolution, if you will. That promise was important to me. It was supposed to grow into a list of accomplishments I could rub in anxiety’s face the next time it reared its ugly head. So, I honored it. I may have had to psyche myself up all day, talked myself out of backing out as I got ready, and had a minor anxiety attack in the car outside Panera Bread, but I honored my promise. And you know what? I’m sure as hell going to do it again. There were a lot of fears circling my head- what if I can’t them? what if I’m too old, or too young, to fit into the group? what if there’s nowhere for me to sit? will they judge me because I’m came late? will they feel like I’m intruding? Fear number one was shut down the minute I pulled up. I got a spot right in front of the restaurant’s floor-to-ceiling window and saw a woman in a NaNoWriMo tee handing out papers to a group with laptops and notebooks spread across a long table. Ducks in Viking helmets and a huge NaNoWriMo poster board were perched behind them like billboards announcing who they were. So, I’d found them. No turning back. The group was mixed, people of all different ages crowded into one corner of the restaurant; a visual reminder of NaNoWriMo’s far reach. When I walked up and asked, “NaNoWriMo?”, they all chorused a cheerful, “YES!” and offered me a seat. They were welcoming, included me in conversations already brewing, asked me about my novel and were just as excited to tell me about theirs. We were a hodge-podge mix of librarians and yoga instructors, software engineers and retirees, students and office administrators. We were animal lovers with goats and dogs and cats at home all gathered under one roof to share a love of something so wild and crazy and weird and fun that, in that one Panera Bread on Long Island, no one understood but us. I felt part of the group the moment they said hello. Also, I got a TON of words out. In between conversations of what makes YA, YA and who was a NaNo Rebel, I banged out 3,375 words in one sitting. I’ve already started checking my calendar to figure out when I make another write-in. It was a really wonderful experience, and I’m so glad I didn’t let my anxiety keep me home this year, because I met some really wonderful people on Saturday, and I’m so glad I get to write alongside for the rest of the month. Write with me this November! Add me as a NaNoWriMo Writing Buddy: xdivinerose. Every Monday, Wednesday, and Friday leading up to the start of National Novel Writing Month 2017, I will be posting NaNoPrep Prompts to my Twitter, Instagram, and Facebook! At the end of each week, I'll post a round-up of the three prompts posted, along with my own responses to the prompts. Here is round-up number three! Pick any character(s) from your story, major or minor, and write down three of their biggest fears. Be detailed. Did something happen to make them afraid? Are their fears rational, or are they phobias? How do they deal with their fear? Do they hide their fears from others? Think about how these fears might come into play in your story. One – The lighthouse door heaves open. A wheezing sigh. And inside, a single beam of sunlight filters down the middle of a metal staircase. Shadows and dust dance up the steps. Echoes float from above; footsteps climbing down. Mingus lingers at the threshold, half his body tilted inside, and calls up the steps. Bowie’s voice calls back; tells him to come up. He says his fine and shoves his hands in his pockets. Steps outside, leans against the lighthouse with his gaze to the water, and waits. She doesn’t mention it when she joins him. Doesn’t say a word because he’s never gone up the lighthouse stairs, never climbed to the watch room, never set foot on the tower deck. He went on a Ferris wheel once as a child, felt the car sway and rock in the wind at the top, and that had been it. Done. Finished. A relationship over before it had truly begun. Heights and Mingus would just never get along. Two – Rolling waves lap the docks. Dark water washing over worn wood, leaving trails of seaweed and broken shells in its wake. Running off with the near electric fizzle of sea foam. Slipping back to the deep before dredging up more. Bowie stands on the dock, Rhiannon perched on the roof of Island Watch building beside her. Mingus hangs back. He watches the water lap in, drag out, in, out, in, out, again and again. Debris falls onto the cracked concrete street. Water lines build higher and higher on the freight boxes until the tide finally retreats. Rhiannon stands on the roof and raises binoculars to her eyes. She says, “Clear.” Hops down from her perch. Only then does Mingus step forward. The water harbors too many secrets. Can wash up shocks as it pleases. He doesn’t quite trust it. Never really has. Three – His mother first. Gone at sea. A routine trip, that’s all it was, to aid the mainland. They needed EMTs, doctors. Nurses like his mother. He begged her not to go, but she kissed him goodnight and promised to be home soon. She never did come back. Then his sister, before her time (Maybe it was her time, Gus, Bowie once said, and Mingus didn’t speak to her for two straight weeks). Gone. Just like that, and with the ground too frozen to bury her. And now his heart skips a beat when he can’t find someone. He has nightmares- sees Bowie, Rhiannon, Puck cold and pale on the shore. Gone. He’d shake until he could see them, hug them, feel their heartbeats and their breath and know that this time they’d survived, that this time they were okay. But how long could that last? Would he lose them for good? Where does your main character go when they're stressed? Do they try to be alone, or do they seek out others? What makes them feel better? Write about the place they run to or the person they seek out. Write about how it makes them feel to walk into that place or to see that person. Get in their heads. Learn their feelings. Bowie always gives herself two options. The first is seclusion. A hike along the rocky shore, down to the jetty that juts far into the water. She climbs onto the slippery stone, perches herself and its highest point, and lets the sea spray wash over her. Tilts back her head to watch gulls swoop in wide circles over her head. Her hair rippling like gold ribbons in the wind. Her jeans soaked by the waves. Saltwater on her skin, her lips. Her heart slows. Her breath matches the waves as the roar in, then out. Steady. Almost melodic. She stays until she feels like if she sits there any longer she might get washed away, might slip into the sea and never return. She lets that thought linger perhaps a moment longer than she should, and then she slinks back home with the ocean tangled up her clothes, in her hair, in her heart. The second is a warm home. Straight into town, the second left from the docks, third house on the right. Always neat and tidy with windows glowing orange and warm from a freshly stoked fire. Rhiannon at the stove looking like their mother with her hair thrown up and her sleeves rolled to her elbows, fretting about the kitchen. When she sees Bowie, she stops. Face warm as her hearth she smiles and open her arms. For a tiny woman, her embrace is strong – firm and solid, like its holding Bowie to the ground. She melts into her sister, who smells of lavender even in the dead of winter when the snow and ice stop the plants from growing. Puck comes downstairs, hair damp from his shower, and welcomes Bowie just as warmly. And he knows, always seems to read Bowie – read everyone – and busies himself so that the sisters might talk. Sometimes they do. And sometimes they wash dinner dishes together, side by side, quietly singing the songs their mother always loved. Search the term "ambient noise" on YouTube. Find a video that interests you, hit play, and set a timer for 20 minutes. Get writing! See how many words you can get done in that time. See how writing to white noise affects you do. Do you like it more than writing with music? Are you wishing for your playlist back? There's more to autumn than the crunch of the leaves, or the colors spread across tree tops as if they were a painter's canvas (abstract, the MoMA's dream, mystery and intrigue lying beneath every brush stroke and lurking in every color). There's the crispness in the air. Electric, almost. Vibrant in the way air never is during summer, or spring, or winter. Clear and sharp, but not quite cold. The skies richer, bluer, and with clouds puffed up like cotton balls, so round and fluffed they look fake. Painted on. Tacked into the sky by God's hand. An art project done by an angel, a diorama of what the earth is meant to look like. The kind of beauty we're meant to see every day. What the heavens intended for us. Strange, though, how everything dying brings about such a feeling. The leaves as they rust and wither and fall from their mother's arms. Whispering goodbye to the branches they called home, to the trees that let them kiss the sun each morning and hug the moon at night. Every crunch beneath a winter boot is another tiny farewell. A goodbye. Until all the trees are bare. Stretching up toward the sky as if to say, "It's your turn, now! Let them see you! Let them love your endless blue, the stars dropped like diamonds across you, the clouds that drape you. Let them know you!" Branches outstretched like arms as if to say,"This beauty! Here! Beautiful even without our greens, without our yellows and oranges and reds, without the pink and white flowers we shed! Beautiful on its own! Always!" Because maybe dying isn't just an end. It isn't just a closing door or a farewell, isn't just a gravestone that will crack and weather, a mound of dirt that will get covered by grass that will get covered by leaves that will covered by snow. Maybe dying is just a moving on. A passing through. The limbo between our bodies and our purpose. Because we live these lives wondering who are we meant to be and what we are meant to do. We fall on our knees in front of candles, the smell of incense thick around us, and we ask God why he put us here. Perhaps the beauty in autumnal death is his metaphoric answer. Because death and, in turn, life is not all suffering and heartache. Sometimes it is relief and release and sometimes it is a rite of passage. It is a way for loved ones to stay forever, in our hearts, having left their mark in life. Their leaves drop to the ground and branches stretch upwards as if to say, "Look! There they are! Up there! Watching you! With you! Sitting on the clouds! Can't you see them! They're beautiful!" And in autumn, with the shedding of each leave, they clear the path so we may see more clearly. "Look!" they say, "Up there! Beyond only our branches now, can you see them in the blue of the sky! Warm and watching and loving you still!" Because autumn feels like living even though it is made by dying. It gives us new sights and sounds and smells, every year in perfect time it ushers us along. Moves us with it. Begging us to see the beauty that is always there. That will be there when the snow falls in the winter and when the spring sun thaws it out. That will be there in the summer heat, gold beneath the sun. Remember all those scenes in autumn. Cherish their beauty that is always there. I find beaches most calming in autumn. Empty, mostly, save for a few wandering souls. Our paths cross along the shore. We walk bundled in sweatshirts and scarves, gloves sometimes, coats sometimes, and let the waves lap playfully at our boots. And the water is bluer in autumn, too. Washed itself clean. And the winds raise the waves up higher. Up towards the sky. The sky the trees in the nakedness show to us. A grand display of blue. There are still beaches in autumn, and they smell like salt and leaves instead of suntan lotion. The seagulls still fly in their broad circles and drop their seashells on the boardwalk. A meal. Their leftovers scattered across a parking lot until the air gets too cold and they flee. Briefly. Only long enought that you come to miss their calls, miss the way they shouted to each other the waves. And then they return. Go about their business. Become a nuisance until autumn makes them charming once more. The woods in autumn open up wide. Like doors pushes aside. You can see more of the trails, the sky, the deer leaping over fallen logs and racing each other between the barren trees. And acorns drop, drop, drop onto the ground in a grand symphony of harmonious thuds. Breaking up the quiet for the briefest of moments. You can hear every little animal scuttle through the brown and red and orange leaves and all at once remember how much more there is to this world than just you. How your life is happening at this perfect moment where leaves can fall and acorns can sing and gulls can cry and deer can run and water can lap over cold shores. And you are here among it all. Living among it all. A part of this beauty, of this endless gorgeous beauty, of this artwork God has made of the world. You live and breath art. Everyday. Everyday you live in a painting that should be hanging in the Lourve, but you only realize it when the leaves change colors and start to fall. You only realize it when the sky gets bluer and the ocean colder, when the birds start to drift southbound. You only realize it in autumn. 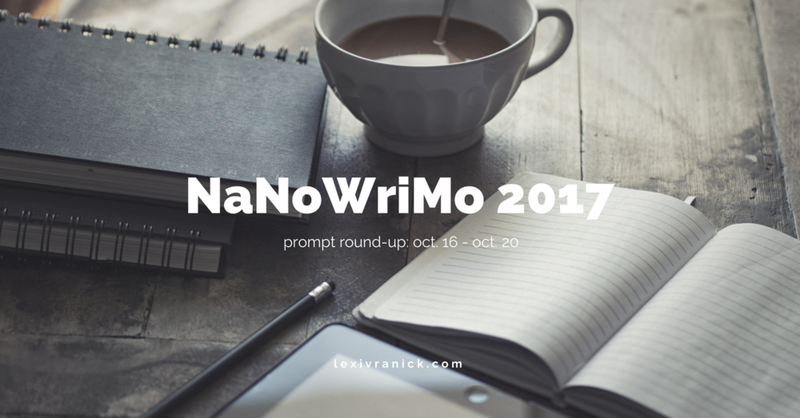 Every Monday, Wednesday, and Friday leading up to the start of National Novel Writing Month 2017, I will be posting NaNoPrep Prompts to my Twitter, Instagram, and Facebook! At the end of each week, I'll post a round-up of the three prompts posted, along with my own responses to the prompts. Here is round-up number two! Pick one character from your story, major or minor, and describe their fashion sense. What colors do they like to wear? Do they like to dress up or stay casual? Where did they get their clothes from? What is their favorite item of clothing? Add as much detail as possible! Rhiannon’s closet is a tangled heap: jackets with roses embroidered down their fronts and sleeves frayed from age, knit sweaters with loose threads poking from their hems, thermal shirts in solid colors – blacks and whites and grays, a red rain coat stashed in the corner, a hand-me-down from her sister, and hidden by a row of plaid patterned button ups. On the bottom rung sits sundresses with florals laced about their skirts, most of the colors sun-bleached and faded. Saved over the years, relics of simpler times. The whole of her closet smells of sunscreen and sea salt; scents seemingly woven into all the fabrics of all her clothes. She pulls a pair of jeans, a pair that fits snug around her waist but stretch too far past her feet. She scrunches excess denim up around her ankles. Slips on brown boat shoes with sand stuck in every crease, little granules that will never shake free. She grabs a white cotton t-shirt, its hanger swinging in its absence, and pulls it over her head. Then, feeling the morning chill through her open window, she grabs a denim jacket so old the elbows are nearly white. Vines of green thread traverse the sleeves and end in rose buds at the shoulders and down the front. A finishing touch: Rhiannon tugs her necklace, a silver quarter note, so that it rests atop her shirt. Choose one location in your story (a character's house, a frequented bar, a park, a restaurant, an office, etc.) and describe it from the point of view of someone walking into it for the first time. What would they see? What would they hear? What would they smell? Are there other people there with them? Is the space loud or quiet? Clutter. In maps across a wooden work bench, creased and crinkled and tearing at the folds. In compasses and binoculars and seashells strewn like autumn leaves across the maps and their vast oceans. In a heap of quilts and blankets piled high on a thin mattress. In mahogany with jackets and sweaters draped over their backs. Sand, trailed in on boots and boat shoes, scatters across warped wood floors. An open window lets in a soft sea breeze, and with it the smell of salt. Salt, old wood, rusted metal. Scents encased inside the watch room. Inside the tower, even, spiraling up the stairs and seeping into the very walls of the lighthouse. In the distance, far below the tower, waves crash against the shore, against jagged rock jetties. Seagulls fly in wide circles outside the window, calling out to one another. Footsteps echo up steel steps. The ladder outside the door rattles. Bowie enters, tugging her jacket off. She tosses it atop a growing pile on the back of a chair, swipes binoculars off the work bench, perches herself at the wide window to peer out toward the horizon. Turn on Ocean by John Butler and free write for the entirety of the song. The song is just under 12 minutes long. See how many words you can write in that time. To challenge yourself even more, use a writing tool such as Write or Die or Written? Kitten! to motivate your free write. Sunlight ripples off the water, golden sparks catching in the waves. Gulls fly in tight circles overhead. Tighter. Tighter. Tighter, still, as they drop lower and lower. Sea spray sticks in their feathers and speckles their beaks as the circle around and around, watching fish and their shimmery scales glisten beneath the water. Just beyond the surface, obscured only by the ripples of gold and the rolling waves. Ankle-deep in the surf, an old man waits with a long fishing line. The gull's shadows flit over him, shielding the sun, then revealing it again. Over and over as he and the birds fight for the same prey. Calf-deep now, he waves into the shallow water, his loose jeans rolled up to his knees, his feet bare and sinking into wet sand, buried further with each lap of the ocean. Shells and shards of shells are tossed about beneath the surface. The sharp edge of one nicks his ankle right at the bone. He hisses, jerks slightly. His line jerks with him and sends ringlet ripples drifting around his hook. The fish startle. Tail fins splash in frantic motions. Scales glisten, glitter, gone. Gone deep into the navy dark blue stretched out in front of him. One gull caws, and then another. Annoyance. Defeat. Their wings beat hard against the wind as they raise themselves higher and higher and drift off on the breeze. Impatient. On to another attempt at another meal. The old man stays put, though. Stands his ground. With every lash of the waves, with every fizzle of sea foam, he sinks deeper into the sand. Soon, perhaps, he may become a fixture of this beach. Of this ocean. A statue preserved by sea salt and buried in sand. Children would whisper rumors about the statue of the old man standing over the waves, about how he was alive once, just a fisherman out for an afternoon. They would come up one by one and try to poke him, spook him, make him move. Try anything to startle him, to bring him back to life. When he was a child, they had stories like that. The haunted house on Maple Street, or the ghostly voices whispered in the park off Sycamore. The neighborhood kids were always chasing ghosts. He wades deeper still. The water, with each rock of the waves, licks at his cuffed jeans. He doesn't mind, though. They need the cleaning, with their green grass stains and dirt caked into the fabric. Nothing wrong, just hard work, just a show of hard work. He breathes a sigh. One gull caws, and then another. The pair returned to resume their hunt. Circling above him. Them, waiting. Him, waiting. Every Monday, Wednesday, and Friday leading up to the start of National Novel Writing Month 2017, I will be posting NaNoPrep Prompts to my Twitter, Instagram, and Facebook! At the end of each week, I'll post a round-up of the three prompts posted, along with my own responses to the prompts. Here is round-up number one! spring right out of bed? Thin, gold stripes gloss the worn wooden floor. Sheets rustle. A low groan sounds from the tangle of tattered blankets and fraying quilts. One leg emerges from the mound of bedding strewn across the low mattress, and then another. Bare feet hit the floor. Bowie’s hair slipped from its elastic in the night and was now a mess of blonde knots spilling about her shoulders. She stretches her arms toward the ceiling so high her back curves as she yawns into the quiet morning air. A gentle breeze whistles through the crack in the far window. It smells like salt. It always smells like salt. Outside, the waves crash over the ragged rocks ringing the lighthouse. Bowie stands, crosses the room, leans out the window to breathe in the sweet, salty tang of island air. The sun is only just rising. Bowie always seems to wake with it; an early-riser since her youth. She takes a pair of battered binoculars resting on an old workbench and uses them to scan the hazy horizon. It was clear, as it always was. No boats. No ships. Not even the splash of a dolphin’s tail. Just rolling waves and seagulls flying in wide circles over the water. She slips on a pair of loose, worn sneakers and shuffles toward the door. First she shimmied down the ladder connecting her quarters to the spiral stairs. Ribbons of sunlight stretch down the iron staircase. Bowie’s footsteps echo against the stone walls as she moves downward. When she emerges, sea-spray kisses her cheeks. It catches in her hair, which she tames with her fingers and twists into a haphazard braid. She gives the horizon one last sweep before turning towards the beach, toward the concrete path beyond it, where a cup of hot black of coffee is waiting for her in town. scene from the mother's perspective. A sink overflowing with dishes: plastic baby bottles, dinner plates, forks with spinach leaves stuck between the tines. A small radio is perched on the windowsill, the volume low and speakers crackling. Mira hums as she switches on the faucet and drizzles soap over a purple sponge. She gets about halfway through the piled mugs and flatware before she hears a small cry from the next room. A smile lights her face. She dries her hands, soapy and wrinkled from the water, on her jeans as she moves to the living room. “Good morning,” she coos, and her child begins to settle. Chubby hands reach or Mira, who gladly scoops Bowie into her arms. “Did you sleep well?” Bowie, a mere two years old, nods and rests her warm cheek against her mother’s shoulder. Across the room, Mira’s youngest sleeps still, swaddled in her bassinet. Mira checks on her briefly, then sweeps back into the kitchen with Bowie hoisted on her hip. “Do you want to help Mama?” Mira asks. Bowie’s head raises off her shoulder and she gives another nod. “Here you go,” Mira says, giving a dish cloth to her daughter. She held up a still-dripping coffee mug. Written? Kitten! to motivate your free write. Waves. Rolling, crashing. Sea foam spraying into the misty air. A thick fog spread heavy across the hazy morning sky. Gray. Gray, stretching far to the left and to the right. Stretching high into the sky and diving down, down, down into the depth of the sea, where it deepened and darkened and turned an inky black. It smells like rain. A storm brewing on the horizon. Clouds gather, crash together, stick to one another. Form a huge mass at the far reaches of the heavens. Heaven. Up there, beyond the clouds and the sea spray and the fog and the waves growing taller and taller. Splashing over jagged rocks jutting out between ripples in the water. Maybe those waves will reach heaven. Could waves do that? If a spirit can, perhaps sea spray can, too. Perhaps the salty air drives up and up, beyond the rain heavy clouds, floating farther than the naked eye can see. Maybe it calls the sun home. Brings those golden slivers slicing through the gray. Slicing through the stormy sea. Ribbons of morning light stretched down into the wine dark waters like a mythical hero reaching for his destiny. The morning cuts through the haze. Takes back the sky. Bleeds blue into the ocean once more. Calms the waves. Sends the sea salt home. Warms the world for another day. It starts in a small Long Island town in 2007. It was late September. The fall chill hadn't fully taken over yet. The air was warm as my friend and I walked our cross country practice cool down in the streets around our school. We were freshman. We'd known each other since fifth grade, and stuck together as we navigated the grand landscape of our new high school. We were both writers, which is probably why she asked me, "Have you ever heard of NaNoWriMo?" "NaNoWriMo," she said. "National Novel Writing Month. You're supposed to write a novel in a month! I think it's supposed to be 50,000 words. It happens in November." Here's what I should have said (Read: Here's a normal person would have said): that's crazy, who would do that?, that sounds insane, how is that possible?, is that a real thing?, are you high?, but why?. Here's what I actually said: "Let's do it!" We made a plan to write a novel together. We plotted together, came up with characters, and planned how we would collaborate. We were excited. We were ready. But November came and went, and we didn't write a word. Okay, that's not true. We wrote a lot of words. We wrote term papers, history reports, and homework assignments. We joined our school's creative writing club and stuffed notebooks filled with poems and short stories. We just didn't write our novel. But the seed had been planted. We both new that National Novel Writing Month existed, and we both wanted to try it. When summer came around I started looking it up again. In August I started to plot a story. In September I carried my first NaNoWriMo notebook to school every and filled it with character profiles. In October I outlined scenes on the bus to and from cross country meets, and in November 2008 I dove headfirst into my very first official NaNoWriMo adventure. I've participated every year since then, and only missed the 50K mark once (it was 2011, and I was a freshman in college). This upcoming November I will take part in my tenth NaNoWriMo, and I am filled with the same storm of excitement I felt way back in 2007, on a side-street by my school, as my friend and I plotted out our first (failed) attempt. NaNoWriMo has become so important to me. I look forward to it every year. I love the community, I love the rush, I love the sleep-deprivation that comes around week three when playing catch-up becomes a desperate necessity. In 2013, my sixth official year, I started a tradition of donating each October as part of my NaNo Prep. It means the world to me to give back to this cause that has been a constant presence in my life, that has grounded me, and that has kept me writing even when my depression and anxiety disorders plunged me into month-long hiatuses. NaNoWriMo has kept me strong. It has given me the confidence to continue on with writing, and the drive achieve my long-lived dream to self-publish my work. I've learned so much about writing through NaNo. I've learned the magic of messy first drafts and the importance of getting words on the page. I learned about the falsity of writer's block and how inspiration can be found in the darkest, seemingly-emptiest corners. I learned not to take myself, or my writing, too seriously and I learned that sometimes being silly and weird is just what your story needs to help push it along. I am so incredibly grateful to my friend for mentioning it that one fateful day back in 2007. I wouldn't be the writer, or the person, I am today without her, or without NaNoWriMo. NaNoWriMo is currently on a Road Trip, raising funds to update its website and to continue providing writers around the world with programs that promote and encourage creativity. If you are interested in supporting NaNo along this trip, visit https://store.nanowrimo.org/road-trip.